The curse of the Laguna women is long and painful. It is filled with unrequited love, anguish, death, hate, abuse, revenge, ghostly hauntings, and powerful magic of the beautiful and dark sort. It is the sort of magic that touches everyone who comes in contact with the Lagunas -- men and women alike. The House of Impossible Loves covers multiple generations of Laguna women who are cursed to have "tragic love affairs and to give birth to girls," who in turn follow the same pattern as their mothers. Along the way, Lopez Barrio creates memorable and compelling characters with gray areas -- some are worthy of pity while others are worthy of compassion, yet there are reasons to dislike and even hate more than a few. In the Laguna women, Lopez Barrio creates a truly cursed family. Clara Laguna falls in love with an Andalusian who loves her but afraid of the curse, won't marry her. 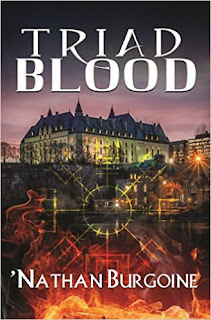 He gives her the deed to what becomes Scarlet Manor, a place she turns into a brothel as part of her revenge against him. Clara gives birth to Manuela who is reared by Bernarda, a servant/cook who can barely speak, but whose only goal in life is to love Clara Laguna. Manuela's upbringing shapes her into a woman who seeks nothing less than perfect respectability. When through no fault of her own Manuela becomes a victim of the curse, she becomes a cruel and terrible master of vengeance. Her beautiful daughter Olvido becomes the frequent target of her rage and frustration. Olvido's life story is the longest in this book and it is simply both beautiful and horrifying. Olvido's beauty garners Manuela's rage and hope that she will be the one who will attract a husband that will break the curse. But she falls victim to the curse with an all consuming passion when she and Esteban fall in love with each other. As predicted, it ends in tragedy, but does it really? Margarita is born and she in turn gives birth to the first Laguna boy, Santiago. Will he be the one to break the curse? The story takes place in a small, remote Castilian village in Spain that comes alive with vivid and memorable secondary characters. The world seems to evolve around this place but in this place life, with all its cruelties, ignorance, and beauty, seems to stand still. There is magic that never ceases to exist, whether it is the ghosts of the dead that visit the town square in the morning in the guise of fog, or the winter blooming of daisies, honeysuckle, roses at Scarlet Manor, the peeling of bells, the trail of violets as kisses, or the smells and sensuality of Olvido's cooking, magic becomes part of daily life and natural events that occur in this Castilian village. 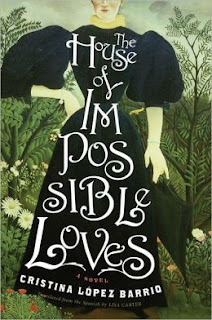 The magical realism in The House of Impossible Loves is comparable to the Latin American style that I prefer. It is not pretty, sweet, or nuanced. Instead it is the type of magical realism that is in your face, and often over-the-top, filled with passionate emotion that spills out and is expressed by depicting it strongly in all the colors of the rainbow: beauty, love, hatred, darkness, compassion, envy, revenge. Recommended.